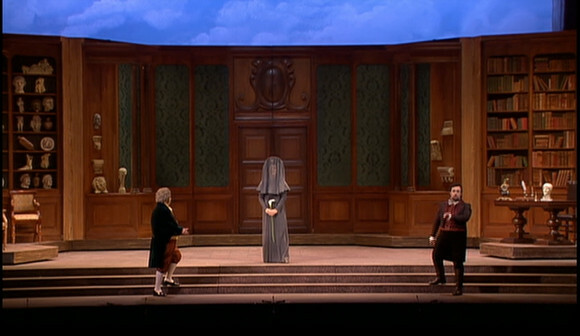 Once in a while one comes across an opera DVD that’s so “ordinary” that it’s extremely difficult to write about it. The 2002 Cagliari recording of Donizetti’s Don Pasquale is one such. Stefano Vizioli’s production is set in 1750s Rome and plays the piece about as straight as a madcap comedy can be played. The singing is rather good and, if the acting is a bit Brian Rix farce that’s hardly inappropriate. At the heart of the piece is Alessandro Corbelli who must be close to being the ideal Pasquale. He gets good support from Eva Mei as Norina and Antonino Siragusa as Ernesto. Roberto de Candia is also quite good as Malatesta but he’s not Mariusz Kwiecien. The chorus is a lot livelier than the average Italian chorus and the orchestra, from Bologna, might be a bit thin on string tone but isn’t bad at all and Gérard Korsten’s conducting is perfectly OK.
Technically it’s atypical “made for TV” DVD of its period. Video director Patrizia Carmine gives us too many close ups especially in the ensembles but it’s not particularly egregious. The DTS sound is good as is the not quite HD picture. There’s a “Behind the Scenes” bonus feature. Subtitles are German, English, French, Spanish and Chinese. All in all, if one saw this in Winnipeg one wouldn’t be disappointed but why it made it to DVD is a bit of a mystery. This entry was posted in DVD review and tagged cagliari, carmine, corbelli, de candia, donizetti, dvd, korsten, mei, siragusa, vizioli by operaramblings. Bookmark the permalink.